This article was first posted in September 2012. The strategy outlined below worked well until August 2013 and then basically went sideways for over 3 years before perking up again in 2017—when virtually any short volatility strategy worked. I’ve updated the chart and the verbiage to reflect those changes. In September 2017 the Cboe renamed its VXV index as VIX3M. The Cboe does not do things that that randomly so I would be surprised to see VIX3M based products in the futures. The vast majority of dollars invested in volatility oriented securities are bets that volatility will go up. Sometimes these bets are speculative, but more often they’re portfolio insurance. These long volatility bets have proved to be quite expensive—the holding costs are high. Taking the other side of the deal—shorting volatility, or buying products that track daily inverse volatility is quite profitable most of the time, but when volatility spikes the losses can be heavy. Take advantage of the contango/time premium that drains value out of long volatility positions (75% to 80% of the time on average). In September 2012 I found an inverse volatility strategy that looked promising for achieving these goals—it performed for almost a year after I posted it before it stopped working well. As of September 2012, the annualized gain was 70%, the maximum drawdown was 11%, and the Sharpe ratio was 9. The strategy switched allocations 41 times, or on average about once every two weeks. The blue line driven by the strategy, the green line is a simple buy-and-hold of ZIV, and the red line is the S&P 500. 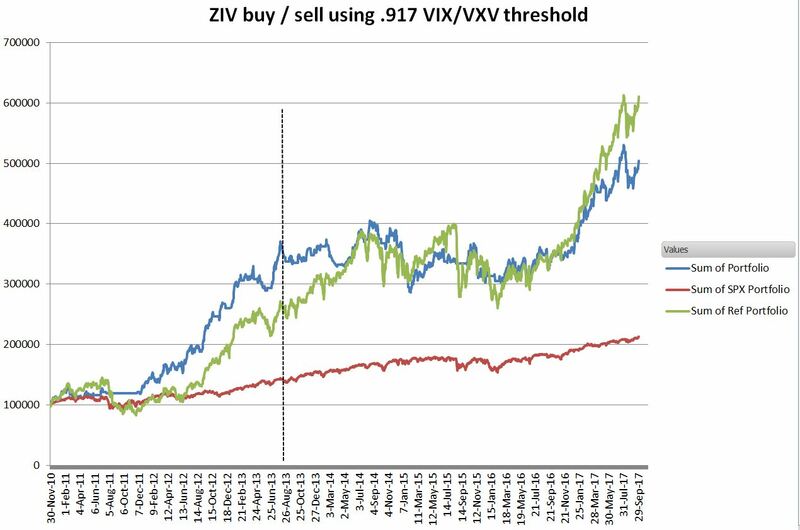 ZIV takes an inverse position in 4 to 7 months VIX futures with daily rebalancing to maintain -1X tracking with the SPVXMTR medium term rolling index. 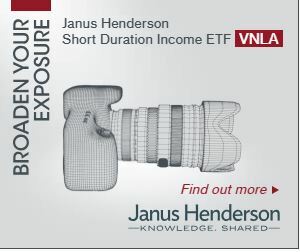 This is essentially the index that Barclay’s popular VXZ medium-term volatility fund follows. Medium-term volatility funds are inherently less volatile than their short term cousins (XIV and SVXY). While you’re probably familiar with the CBOE’s VIX index, the CBOE’s VIX3M (VXV) index is relatively unknown. It uses the same methodology as the VIX index, except it’s computed for a 3-month expectation of volatility on SPX options, instead of 1 month. 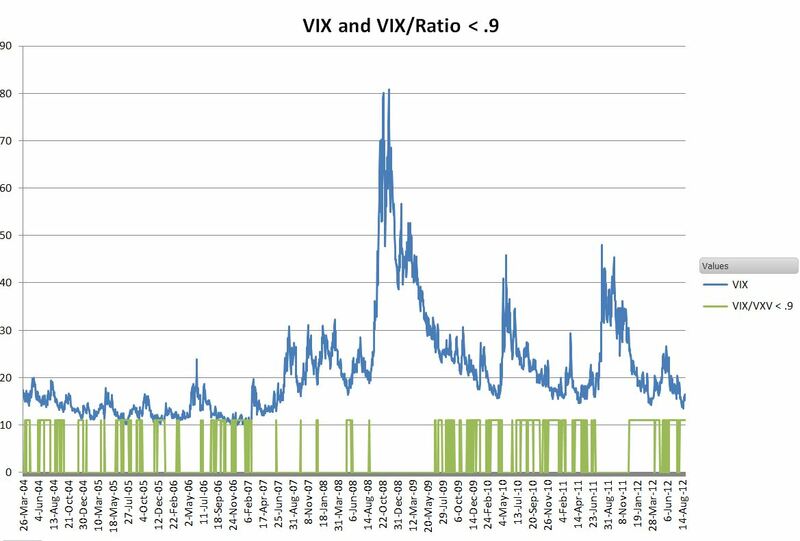 The VIX/VIX3M ratio gives a simple way to evaluate the 1 to 3-month SPX implied volatility term structure without caring about the absolute values of the indexes. For example, if the ratio is below one the term structure is in contango, otherwise, it is in backwardation. Obviously, something happened in 2010 that changed this strategy from going sidewise to 70% annualized growth. It’s likely that something was medium-term contango. 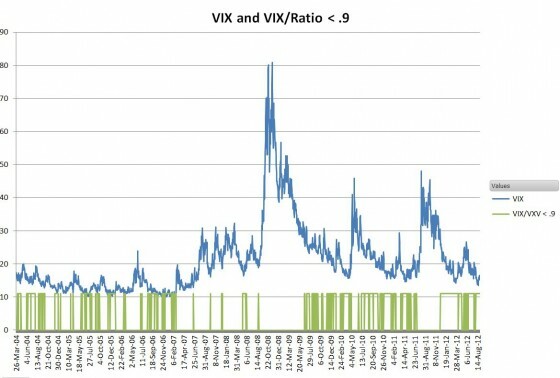 The medium VIX volatility term structure began steepening 2010 Increased levels of contango fuel this strategy. 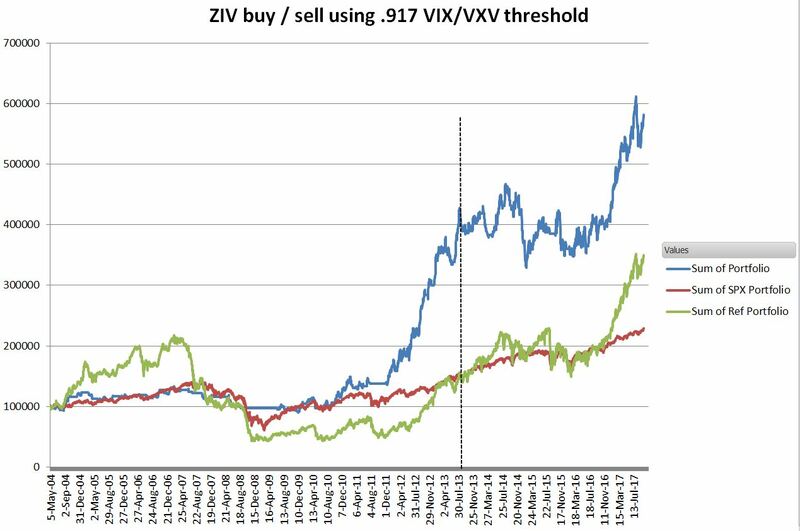 With ZIV’s average daily volume running less than 80,000, and assets under management of around $170 million the liquidity pundits, will cry foul, but my opinion is that liquidity in an Exchange Traded Product is driven by the underlying rather than the fund itself. With VIX volatility futures setting weekly records of volume and open interest I don’t think liquidity will be a problem. The bid/ask spread tends to be around $0.05, or 0.15%, I’d prefer a penny of course, but I’ve gotten good fills on substantial orders at or within the spread. As with any strategy, the past results do not guarantee the future results. In this case, the strategy worked well from September 2012 through November 2013, did not work well from December 2013 through June 2016, and then started working again in July 2016. 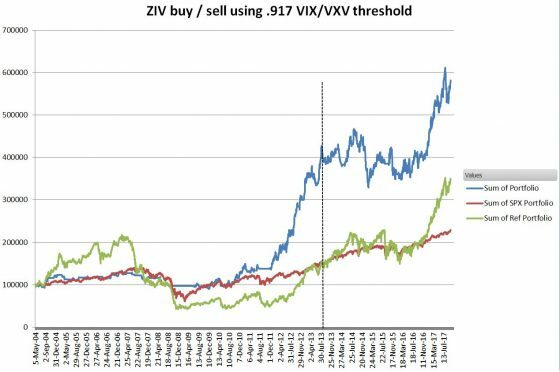 This strategy was in cash on 5-Feb-2018 when the VIX spiked 116% and XIV crashed 96% (ZIV went down 23%) The VIX/VIX3M ratio went over .917 on 1-Feb-18 and stayed about that level until 8-Mar-2018.